Knock, Knock... Who's there?! Mochi... Mochi Who?! Mochi For You! In one of those "Only in Japan Okinawa”, moments I had someone ringing the doorbell and knocking on the door at the same time. I am thinking great now what?! 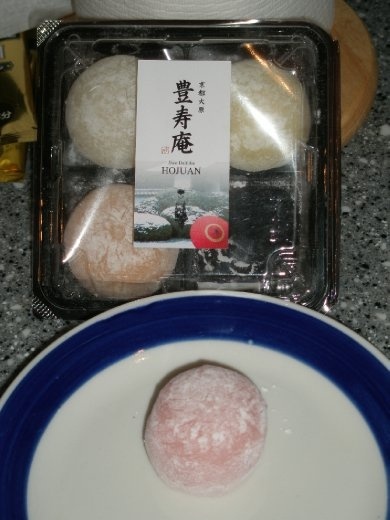 I open it to find a nice Okinawan woman who is selling Mochi of all kinds! In the picture, you are seeing strawberry on the plate, orange, and...well let's just say I was too excited to listen to her tell me what the other two were. Instead, I ran and got Yen all while she was trying to quick ask me if I wanted anything else. I paid her for the mochi and thanked her for it in English and Japanese, arigato gozaimasu.